the Angry Turtle: Nesting... a new concept to me! Well, we are just over a week away from our baby's due date (Nov 21st) and I've been nesting like crazy. This concept was completely lost on me until recently. I had heard people talk about the phenomenon before and I always thought that it was just for people with lots of energy. Oh no! Apparently you can nest out of exhaustion, too. I am tired and I can't stop! This week, David rearranged our bedroom to make room for the nursing chair and a bassinet. I finally sorted and put away the few boy clothes that we have (I haven't done any shopping for Malachi yet, as I want to make sure I don't buy too small etc). Last night with David's mathematical genius, we cut out all the size large diaper blanks (yes, I am still not finished, but Mom is coming to help me out - hooray!). I have a bit more diaper flannel to buy for soakers, but thanks to David's math genius, I even have leftovers from the batch I bought for mediums. Details here. Today, David helped me to cut up recycled clothing into usable panels of cloth. I also whipped up a little hat for Malachi and a cloth bag for the baby shower gift I shared a few posts ago. 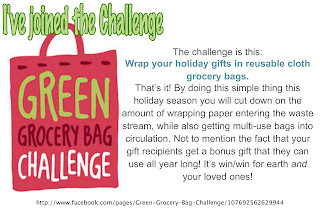 Sorry no pics :( About the cloth bag... have you heard about the "Green Grocery Bag Challenge"? A simple and effective challenge that I'm very excited about. Wrap your holiday gifts in reusable cloth grocery bags. That’s it! By doing this simple thing this holiday season you will cut down on the amount of wrapping paper entering the waste stream, while also getting multi-use bags into circulation. Not to mention the fact that your gift recipients get a bonus gift that they can use all year long! It’s win/win for earthand your loved ones! I love this idea. It's super fun to sew bags to give, but if you don't sew, skip the gift bag from the dollar store and go down their household aisle and purchase a cloth bag instead. Every store I know of sells some form of cloth bag at the checkouts and most of them are around $1. If you sew, but don't want to take the time to sew the whole bag, why not embellish a store bought one instead. I whipped up this little card to attach to each bag in explanation. (Feel free to use it if you want to). More details and links to free tutorials here. Tonight I made three Mexican Lasagna Casseroles (from this cookbook) to freeze and I hope to finish this post and get back to my sewing machine. I have a rare evening to myself (I stayed home from our bible study group - trying to avoid the cold bug before I go into labour). Abby's in bed and I have plans to make a pair of these. Glad to hear you are having so much fun with your nesting. I know exactly how you feel. I had Deryk repairing the broken tiles in our kitchen floor. We were both on our hands and knees. With Graeme I pulled dandelions out of the backyard. Yours sound like more fun though! That does all sound like fun. I haven't touched the sewing machines for a while now because I'm immersed in bathroom reno projects. I can't crawl behind the mounds of flooring and tiles to get to the machines, actually, although Christmas presents are dying to be made. 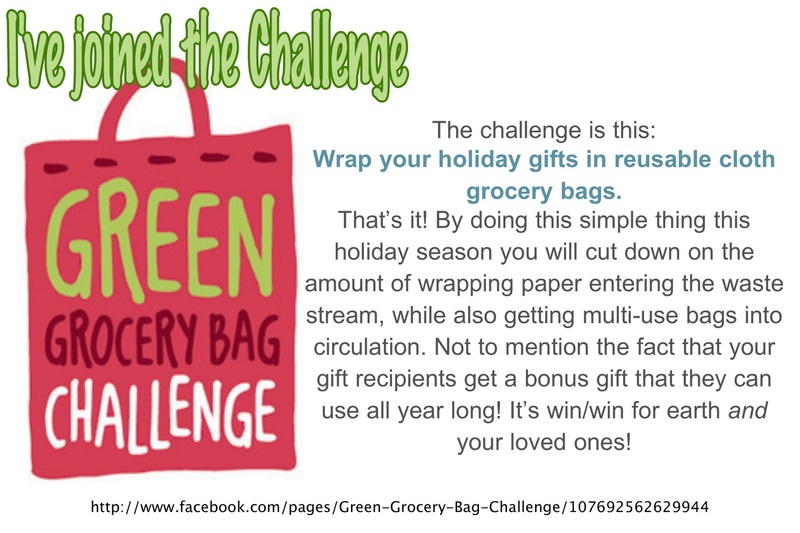 I love the grocery bag challenge. I will have to get the sewing machine out of the rubble to take part though, and most of my gifts go to my own children. They have bags out the wazoo, so I might wrap them in micro-fibre facecloths and silk scarves or something. Thank you so much for embracing this idea and spreading the word! 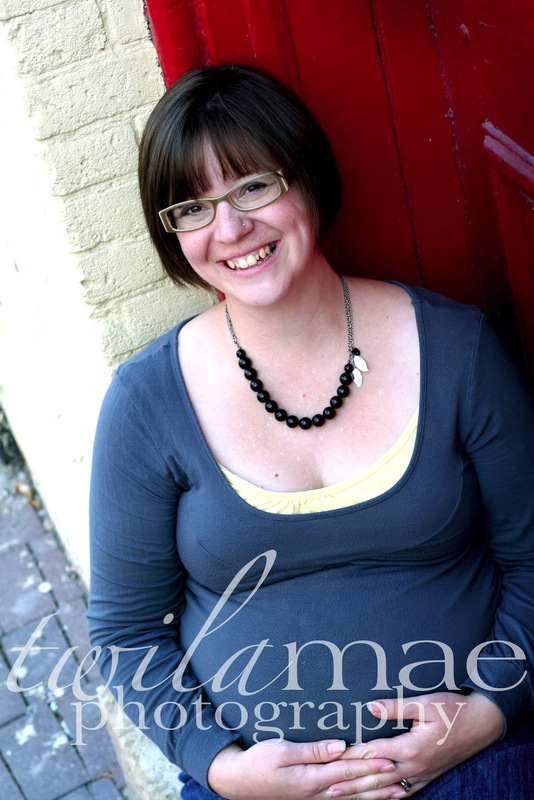 Coralee, did you know that Sew Mama, Sew featured your gift tag on their blog? Somehow I missed the mention but just saw it today. Yay, you!